It's the day after Thanksgiving and I really don't want to cook after yesterday's marathon cooking day. So this easy Roast Chicken and Veggie Tray only takes 5 minutes to throw together and pop in the oven. It is just what I need to get dinner on the table fast with minimal effort and I really am happy about the minimal effort part of the whole recipe! 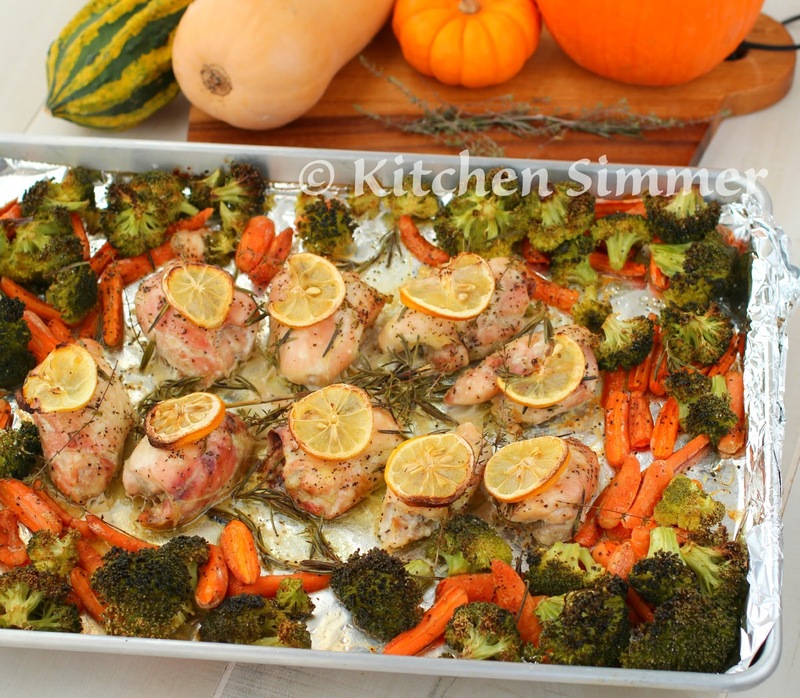 I simply scattered some broccoli, baby carrots, boneless/skinless chicken thighs, herbs and lemon onto a baking tray and put it in the oven for about 30-40 minutes. Easy-Peasy! I had some leftover stuffing, and cranberry chutney from our Thanksgiving feast so it was easy to just heat them up for my husband and son that wanted more "carbs" with their meal. 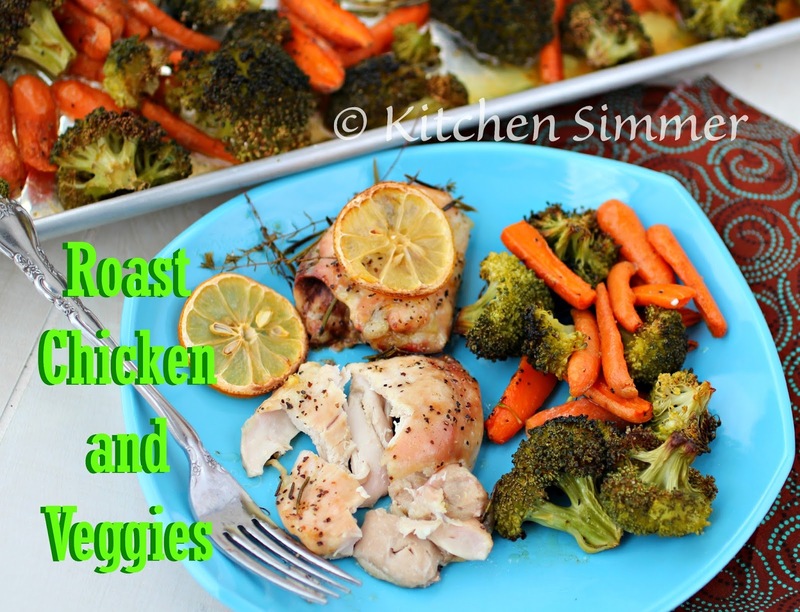 My daughter and I were just happy with the roast chicken and veggies. This meal was so easy and I was grateful for the time to relax while everything baked in the oven. I even covered the baking pan with a layer of foil so I had minimal clean up to do as well. I am glad Thanksgiving comes around only once a year because it's a lot of work. 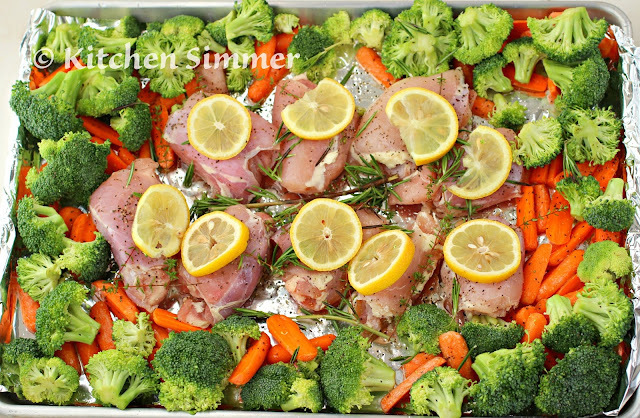 Luckily this roast chicken and veggie tray is so easy, I can make this many times this year when I feel like quick cooking. Step 1: Prepare chicken and veggies. 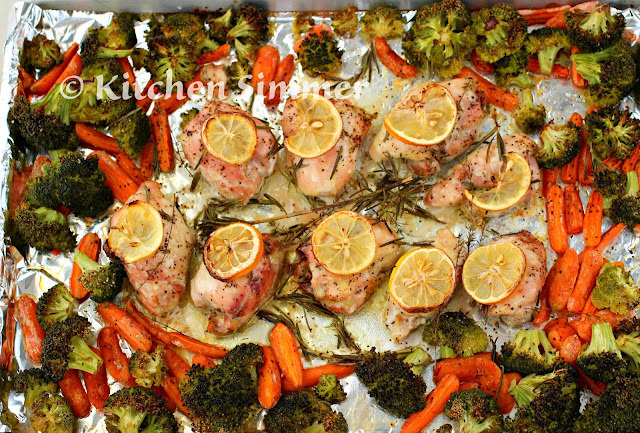 Step 2: Line baking sheet with foil for easy clean up (optional). Step 3: Layer veggies around the perimeter of baking sheet and chicken in the center. Step 4: Season everything well with salt and black pepper. Then drizzle oil over everything. Step 5: Season chicken with thyme and rosemary and cover each thigh with lemon slices. Step 6: Bake in a 425 degree oven for 35-45 minutes or until chicken is cooked through. Note: I added a little dab of butter/margarine on top of each chicken thigh for the last 5 minutes of cooking and this gave a little butter/lemon sauce to toss all the veggies in and add extra flavor. This is EXACTLY my most favorite way to prepare dinner! One pan/pot meals are the best! This one looks delicious!! I have chicken breasts and broccoli just waiting for this one pan wonder. Love it. Wow, would not have thought to make a one pan dinner. :) Nice! Saying hi from Cape Town, South Africa. This looks so good! I love easy! Nothing beats a one pan dinner that's for sure! Love this Ramona! The kind of dinner recipe that saves time but tastes amazing! :D Plus I am loving the caramelized lemon slices on the chicken too!